Established in 1994, EZQuest has received accolades over the years for its product design. When EZQuest began its production for its first products, the company originally focused on data storage for Apple’s Mac products. Below is a sample of EZQuest awards received over the years. With the Internet’s explosive growth, print magazines shuttered their doors, consolidated or moved to a digital format. 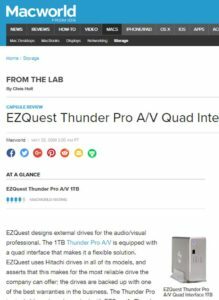 Today, with storage freely available in the cloud, EZQuest is still primarily focused on product manufacturing designed for Apple’s Mac and MacBook products. With Mac and mobile-computing products for busy people the forefront of its product roadmap, EZQuest strives to bring products to market with them in mind. Products that are made with high quality and rugged durability. EZQuest’s high-quality accessories have received recognition over the years. Here is a listing of some of the accolades received. EZQuest’s product line includes Mac-based keyboard covers, shortcuts keyboard covers, foreign language keyboard covers, USB-C cables, adapters, and USB chargers designed for durability and flexibility. EZQuest’s keyboard covers, available for all MacBook models, include clear, Color Expressions!, foreign language skins, and software shortcuts for audio/video and graphics applications. Their cables and adapters are made with stylish design and durability. Visit EZQuest’s online store at EZQ.com. If you are interested in becoming an EZQuest reseller, visit ezq.com/reseller.